Having a monitor system allowed me to see the temp go up to in excess of 160 f.
Goodyear said damage needs more than 200f to occur. Pressure also rose from 85lbs to over 100 on many occasions. I am concerned that there may be a problem. Ire you sure your inflation is greater than the minimum needed to support the measured load for each tire? What speeds are you traveling? 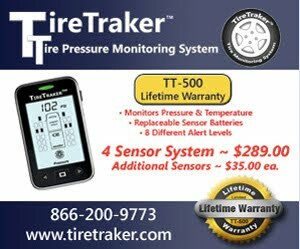 If your TPMS is external mount it is also giving temperatures that are lower than the actual temperature of the tire structure. I'm hoping that tire manufacturers know of this heat increase as speeds increase and have built in 'protections' against blow outs (at least somewhat!). Yes they do but the real question is do operators know the max speed the tire is rated for in RV application (could be 62 or as high as 75 depending on size). The Max speed is not an average but a limit. Travel faster and permanent, cumulative damage and degradation is being done to the tires. If your tires are rated for 65 as most ST type are then I would not consider 64 as providing sufficient margin. I run my Class-C LT type tires with a +10 to +15psi inflation margin and while in theory could travel at 75 I set the cruse at 62 with only occasional 65 to 67 seen. Don't think I have ever exceeded 70. Even on my cross country drive Ohio to Oregon last Summer. Even so I had one tire develop stress cracks at 7 years so ended up needing to do a replacement. Roger certainly impressed us with his knowledge of tires and temperatures but did nothing to assist the average RVer in being safer. A question not a comment: When I check tire pressures in the morning it is common that the tires on the sunny side are a couple pounds higher than the ones on the shady side. Do I adjust so that both sides are the same or should I assume that the tires will even out as I drive and not do anything if the warmer tires are at proper pressure? If neither side is up to pressure, how should I adjust them? You should not adjust your pressure down when it has been warmed. You are seeing the result of the warming of the tire due to being in the Sun. This is why it is said to set your pressure when the tires have not been driven or been in direct Sunlight for the last couple of hours. In your case I think you can check the pressure in the evening when the Sun is on the other side of the RV.